Peter Westgarth was always a tinkerer. Living in Guelph Ontario, he had a large deck that faced southwest and was unbearable to use in the summer. The deck was too big (16’ X 16’) to cover with an awning, so Peter set about making a custom canopy solution to his problem. He knew he wanted the canopy to be retractable. Otherwise, it would block the precious sun in the winter from coming into the house. He also knew he wanted to cover up to sixteen feet out from the house, so he concluded a frame was needed. Meanwhile, Steve Ostrowski, a product developer of many years, was looking to cover his deck in Hamilton, Ontario. Steve called a local awning company to come out and quote the ubiquitous retractable awning. Unfortunately, he was told that awnings can only project about twelve feet from a wall and it would be not be able to cover the sixteen-foot deck Steve wanted to build. Steve made a mental note that awnings only project about twelve feet and ordered his awning shorter than he would have liked. Peter continued to putter with the frame supporting a retractable awning idea and came up with a two track system that he adapted from a slider track he was able to get his hands on. He made the canopy, put it on the two tracks he fashioned, and tried to operate it. It immediately jammed. Peter set about looking for ways to make the canopy system run smoothly and after many failed attempts to float mountings, get better alignment between the tracks, and complicate the sliders, he concluded (credit to his genius here) that it will always jam with two tracks. So the only way to operate it is with one track. Meanwhile, Steve sold his interest in a company that was making his design of folding structures, and started trolling the inventor waters for a new product to commercialize. One of his old suppliers advised him to call this guy in Guelph who had an idea for a fabric panel of some sort. Steve figured Guelph was so close, he’d give this fellow a call. Nobody knows what Peter was doing when he answered that fateful phone call. But the records indicate Steve and Peter got together in May of 2007 to discuss his folding fabric panels. Steve went through the assessment he had for considering new products and told Peter that his idea was great but it didn’t have enough boxes checked off to make it interesting to develop. Peter wasn’t too nonplussed, and invited Steve onto the deck for a drink. The moment Steve stepped onto Peter’s deck he saw the canopy system and asked Peter about it. The single track worked like a charm in spite of its counter-intuitive engineering. When Steve recalled his own awning disappointment from years earlier he decided to look into this opportunity further. With further investigation Steve and Peter concluded the single track canopy system was the product worthy of bringing to market. The debut of ShadeFX happened at the Toronto Home Show in January of 2008. Dear Steve and Peter – I am looking for a solution for my own trellis area and found your website. I am interested in learning more about your product for my own home but also noticed that you do not seem to have a sales presence inTexas. I would like to discuss the possibility of becoming the distributor for your product in Texas. This is a huge market and from my brief review of the competitive landscape you have a product that if priced well would be extremely popular. Do you have someone in Texas as a distributor? 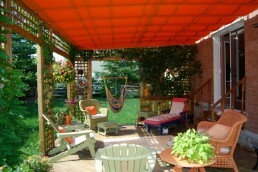 Want to build a pergola with retractable shade at our home in Austin. This is the answer to shading my deck! I am in the process of tearing down the existing sagging wood patio cover on the 11 year old house I just purchased in Santa Clara, UT please send more info on how I can purchase your ingenious product. Thanks so much! That’s fantastic! Please contact me at 855-509-5509 ext.203 or steveo@shadefx.com to discuss your project. I look forward to hearing from you. Does this work if you have ceiling fans mounted? We have a 15′ x 32′ deck with two sets of patio doors. We have no shade so gets very hot. We have just redid the deck with composite decking. Shade FX sounds Ike something we are in need of. We would like more information. Please call 309-373-3780.